We left this morning at 5:35. Kathy Jones of HRF saw us off with a bag of honeyed nuts, calories we needed on the day’s ride. 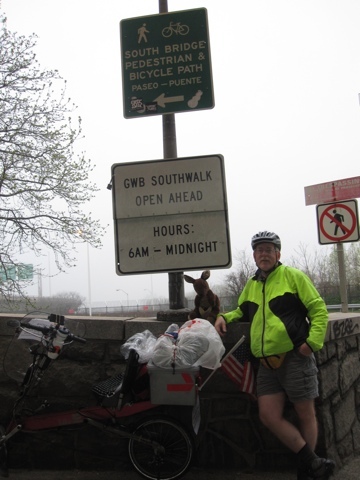 Nancy Freund Heller rode with us to the George Washington Bridge. It’s a little sappy how Jeffrey is still infatuated with her — they met 36 years ago, and have been an “item” for 32 years! 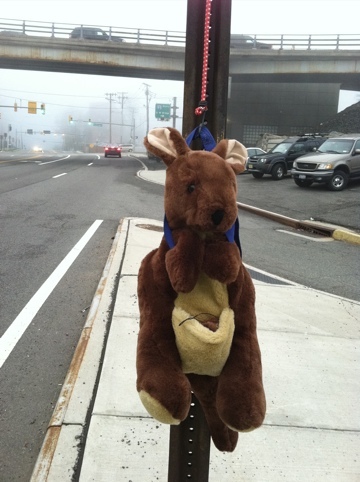 — but she sure is useful, taking our photos, helping us to locate a place to stay here in Budd Lake, NJ. 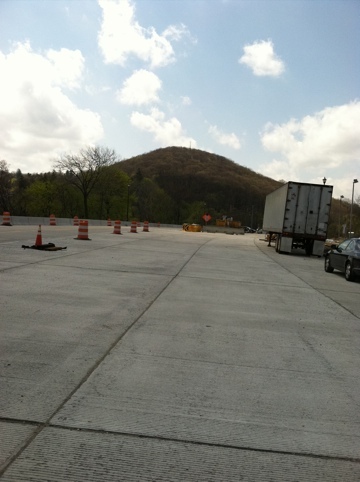 We’d hoped to make it to Pennsylvania today, but due to the confusing route through congested NE New Jersey, the unseasonably warm afternoon, and a tire that sprung a leak (Jeffrey found the hole in the tube and patched it), after 63 miles we were ready to call it a day. New Jersey is said to be the most diverse state. Begining in Fort Lee, and continuing for many miles, we saw signs labeled in English, Arabic, Chinese, Japanese, Korean, Spanish, Thai, and other languages. The farther west we went, the fewer non-English signs we saw; the names on the businesses still came from all over the world, but evidently the customers and the owners have been here longer and English-only seems to be what they’re comfortable with. The family pizzarria where we got our dinner has an Italian name on the door, and the elderly woman behind the counter has an Italian accent, but it is unquestionably an English-speaking establlshment. As the pizza woman has become part of the Establishment, so will later arrivals to America . . . if we let them. 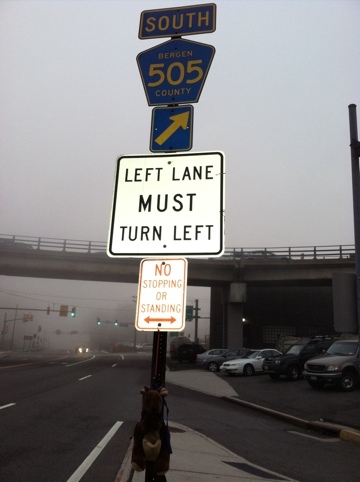 Here are some snapshots from this morning — in no particular order, pics taken in Manhattan, a photo with me (Joey) hanging from a Bergen County (NJ) road sign near the NJ side of the GWBridge (NJ being stingy with “Welcome” signs) and a photo taken in Dover, NJ, showing how the terrain already has changed from the NYC metro area. Our posts may be less polished from now on because we’re making them via an iPhone rather than a desktop computer. Please be patient. To old guys like us, it’s amazing that we can do this from the road at all! 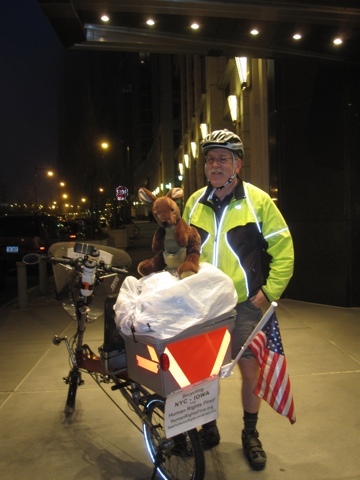 This entry was posted in Human Rights and tagged Bicycle Touring, English only, immigrant assimilation, New Jersey, recumbent bicycle by Joey. Bookmark the permalink. Congratulations on taking the first step – or pedal. Your dedication to causes you believe in is truly admirable. 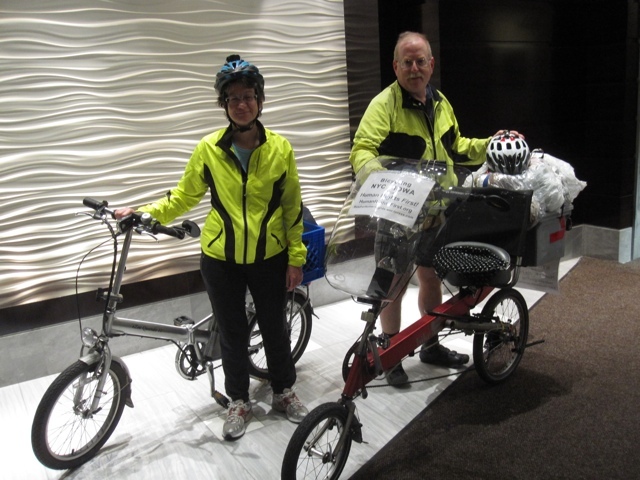 Keep on pedaling – we know you’ll get to Postville. Now I know who Joey is. Mazel Tov on this labor of love for HUMAN RIGHTS FIRST. I will be following your ride when I return from my trip to Israel on May 15th. i keep telling rebecca that her dad is BEAST!